What I really hate is when critics that positively review a space sci-fi story call it “stellar”. Isn’t that just terrible? The funny thing about this review was that I wrote a large chunk of it the other day, well before the release of Star Wars: The Force Awakens. It was based off a few reviews I had read that were largely also spoiler-free and sadly a bit mixed (namely Liam’s — and to a lesser extent, my — film critic idol Devin Faraci over at birth.movies.death), and the tone of that original review was a bit lamenting. Thankfully, I would up having to rewrite the whole thing! …a movie that shamelessly panders to nostalgia while also charting an extraordinary future for the franchise, a movie that is great fun but whose sequences are held together by outrageous coincidence or through a complete disregard for narrative connective tissue. Well, what do you expect, Dev? This is a franchise after all, and it’s J. J. Abrams at his finest. If there is anyone in the biz that is the king of visualized sentiment at the expensive of coherent narrative propulsion, it’s Abrams. But why should we care about that? I am a fan, and I welcome nostalgic fan service. Though J. J. Abrams decided to only use a few of my ideas for this reawakening of the Star Wars franchise, he’s created a modern day spectacle that above and beyond exceeded my expectations and hopes, and yes, even dreams. 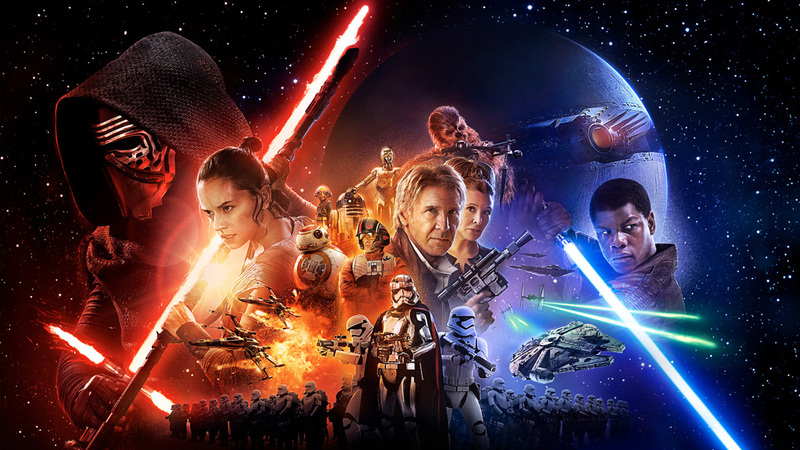 The pace of The Force Awakens is dazzling, the expansive settings astounding, the pandering to nostalgia, gleeful. If ever there was a film that managed to be both a bit predictable and absolutely surprising, it is this one. It’s a character-driven story, and you have your core cast in John Boyega, Daisy Ridley, and Oscar Isaac, who play the characters of Finn, Rey, and Poe Dameron, respectively. The bits and pieces of exposition we get revealing these characters’ backstories throughout the first few acts are sprinkled in nicely. Without delving too deeply, just know that Finn is a Stormtrooper, abducted as a young child and trained all his life to be an obedient killer by an organization known as The First Order, which is basically just a bigger, badder, more Nazi-esque rebirth of the Empire. In his first battle, he can’t deny is conscience and deserts the Order as soon as he can. Rey is an intelligent scavenger and talented mechanic on a planet that is Tatooine in all but name: Jakku. She’s “waiting” for a family that that seems like it might never show up. And Dameron? Well he’s basically the Rebel’s best pilot and soldier. He is a hero. And that’s all you really need to know about him. The Star Wars franchise that we know and love has always been rooted in a core cast of three: your dashing, roguish male pilot; your innocent and courageous Force-sensitive male hero; and your assertive, self-sufficient yet somehow always a damsel in distress. Even in the prequels, young Obi-Wan was basically a surrogate Han Solo in some ways, with Anakin and Padme being the new Luke and Leia. But hey, I won’t even begin to dabble in the many failings of the prequel trilogy. That’s been covered. Many, like myself, are going into this fresh Star Wars experience expecting much more of the same in the way of character dynamics, and that couldn’t be further from the truth. These new characters are instantly refreshing, exciting, and multifaceted, with a debatable exception in Poe Dameron, who comes off rather one-note throughout the tale. I can’t stress enough that you will fall in love with these new characters and the chemistry and camaraderie that is developed. Thrown into the mix with good measure is the wild-card of Kylo Ren who is, for simplicity’s sake, this film’s version of Darth Vader. But here, more so than with the other characters, we get a number of severe deviations from expectation. Whereas Vader was controlled, calm, and always sure of himself — as an aged and powerful Sith should be — Ren is reckless, cocksure, and the furthest thing from in control of his emotions. His behavior is erratic, his rage untempered. In this way, he is even more dangerous, and he sure is powerful. We all know that the original trio of Luke, Leia, and Han make a return to the franchise, with varying lengths of screen time. Without going into too much depth, each of these characters is exactly where you would expect them to be some 30 years after the events of Return of the Jedi. They don’t shy away from the fan service and easter eggs, or the camera’s worship of the Millennium Falcon, which is a delight. In many ways, Star Wars: The Force Awakens is a triumph, but in others (as many other reviews are likely to tell you), this movie is structured as more of the same with a few tasteful alterations. When you stop and think about it, everybody always raves about Empire Strikes Back because it alone, of all the Star Wars movies, blends together quality and originality. Return of the Jedi is a wonderful conclusion, but level with me here: both it and A New Hope start on Tatooine, our heroes spend much of the movie reconnecting, and then they are hurdled towards the conclusion in which they have to destroy a Death Star. This is the most spoilery thing I’m going to say in this review, but if you’re expecting some completely novel plot construction, you’re not going to find it. The story starts on a desert planet. People connect. People get captured. People get rescued. They make it back to the rebels. Rebels realize they need to destroy the new big weapon that the bad guys have made. There’s a ground team and a squadron strike team. Lots of people die. The good guys inevitably win. There is a face-off between the antagonist and protagonist. But if the worst thing this movie has going against it is that its format is remarkably similar to two of the greatest films ever made, then that still makes The Force Awakens one of the best films of the year. My dad has fondly told me a number of times that he saw A New Hope 13 times in the theater (as a twelve-year-old, no less), a privilege I will never know. I first saw the original trilogy at a bit of a younger age, and in a shamefully mixed order that I’d rather not reveal to you. His is the generation that grew up with Star Wars progressively rolling out before its eyes. Mine is the generation that came of age as the prequel trilogy was coming out, thankfully naive enough to not fully comprehend the magnitude of their misery until much later in life. Thanks to other media entries in the brand and now this, we finally have something that just about every living generation can be thrilled for. And thrilled, we all should be.